This is a Systems Model for the gold medal-winning machine 'Bugbuster' produced by the team from Newcastle University for the iGEM 2008 competition. Details about the project can be found here: http://2008.igem.org/Team:Newcastle_University. 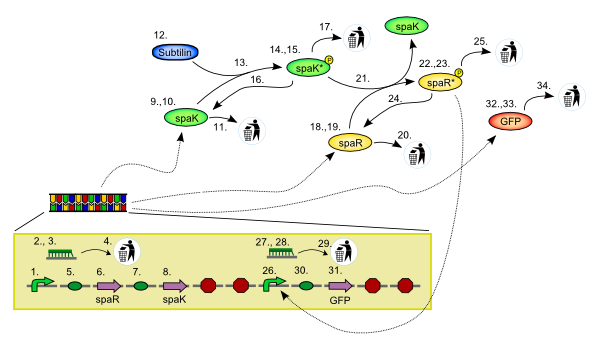 A constitutive promoter leads to the production of proteins spaK and spaR. Subtilin activates spaK which in turn activates spaR. Activated spaR is a transcriptional regulator for GFP. The system senses and reports subtilin concentrations via GFP. 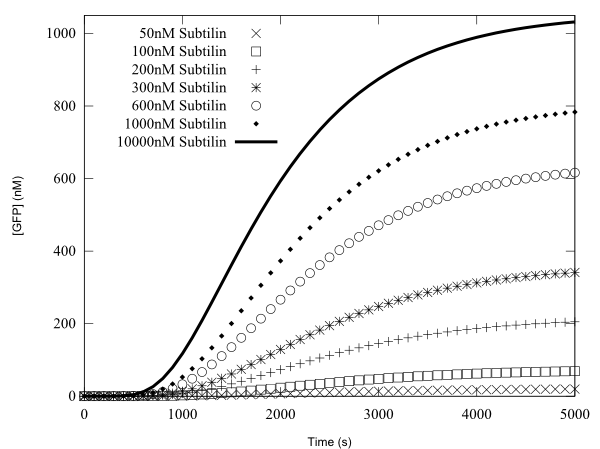 The Figure below shows the GFP time-course for the model, for various concentrations of initial Subtilin. The entire model archive can be downloaded, or a ZIP file encapsulating all the files can been obtained from here. The promoter for spaR and spaK (number 1. above): Part BBa_K104002. The RBS for spaR (number 5. above): Part BBa_K104003. The CDS for the spaR protein (number 6. above): Part BBa_K104004. The RBS for spaK (number 7. above): Part BBa_K104005. The CDS for the spaK protein (number 8. above): Part BBa_K104006. The promoter for GFP (number 26. above): Part BBa_K104008. The RBS for GFP (number 30. above): Part BBa_K104009. Derived from workspace Bugbuster Standard Virtual Biological Machine at changeset 8071102781e2.